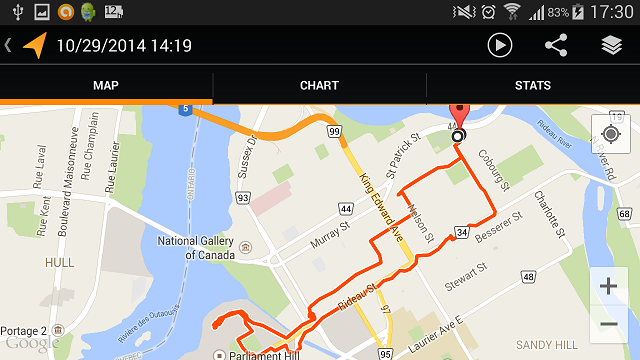 This afternoon, I felt compelled to take a walk to downtown Ottawa. 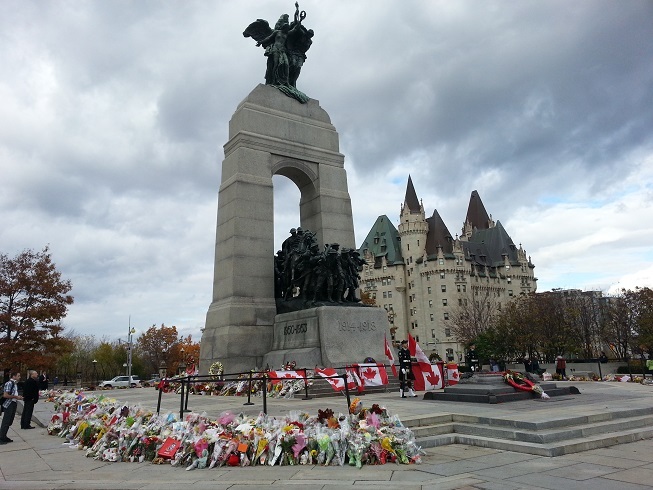 Our home is within walking distance of Parliament Hill and the National War Memorial, where a deranged shooter killed a ceremonial guard, Corporal Nathan Cirillo. It was a beautiful autumn day and the walk was very enjoyable. On my way downtown, I dropped by my favorite computer store (Canada Computers, on Rideau Street) to purchase some needed cables. Then I continued. There was quite a crowd at the War Memorial, and it was full of flowers. Flowers, flowers and more flowers. Also, many Canadian flags. And it so happened that I was very lucky: I caught the changing of the guard ceremony. I even managed to record it on video. Near the end of the clip, a police officer (armed with what appeared to be a fully automatic weapon) crosses in front of my phone camera. He apologized for doing so (I can be heard muttering, “no problem,” on the video). After I was done recording, I stepped over to the policeman and had a brief conversation with him. I mentioned to him that it is an unfortunate necessity that he has to be part of the picture. He understood immediately what I meant. I also thanked him for his service. I then carried on, right up to Parliament Hill. As a free citizen of a free country, I entered the grounds without encountering any guards, obstacles, metal detectors or other obscenities. 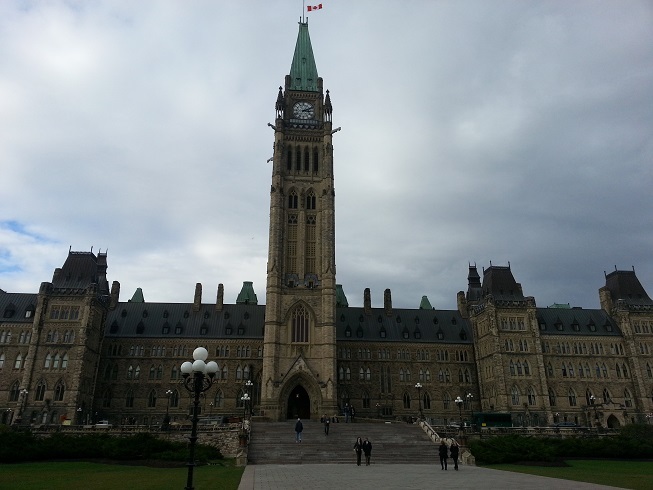 It occurred to me that this is the first time I walked on Parliament Hill in 41 years. 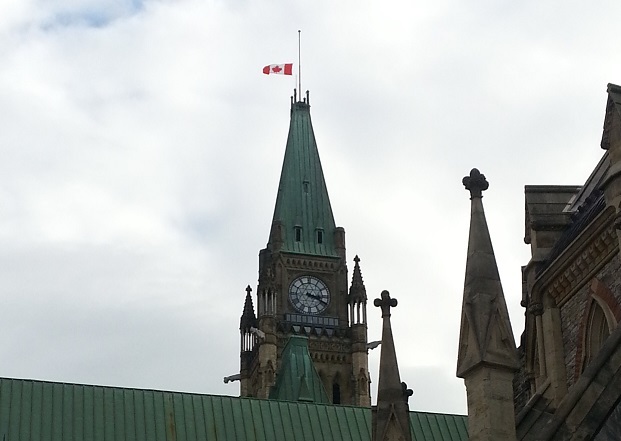 The flag on top of the Peace Tower is still at half mast. Ottawa is still a beautiful city. And, having just returned from the Middle East, it was good to reassure myself that it remains a free city of a free people.